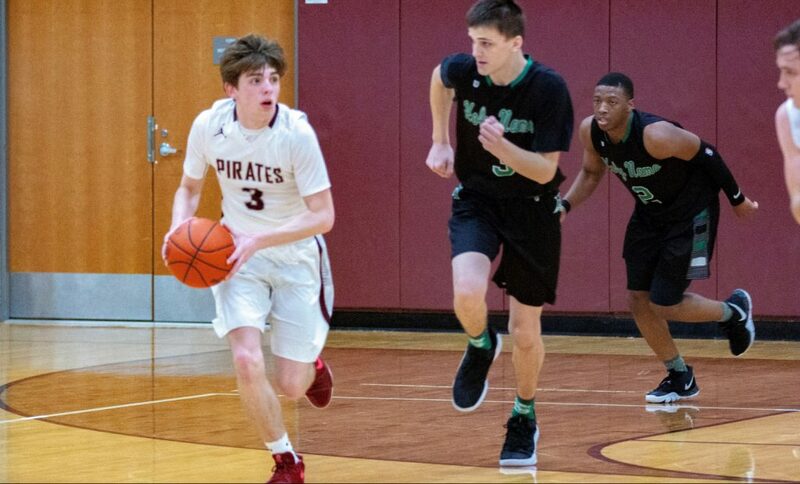 ROCKY RIVER, Ohio – The Pirates got another shutdown effort on defense and put on a tic-tac-toe passing clinic on offense, as Rocky River defeated Valley Forge, 75-44, on Tuesday night. 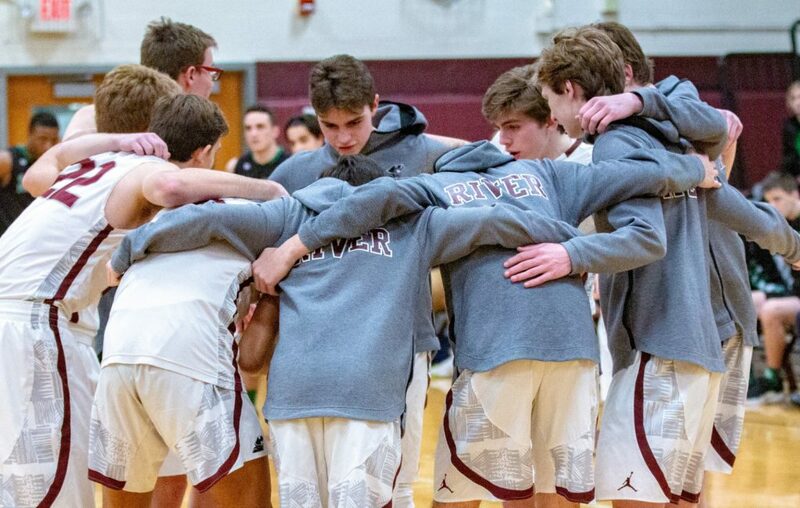 Tommy Ruma (20 points), Luke Coyne (19) and Cristain Dean (15) were the primary beneficiaries of – and co-conspirators in – a Rocky River offense that produced a monster total of 26 assists on the night. Unselfish team play and inventive, crisp passing was on display up and down the roster, in transition, in half-court sets, out high, down low, across the lane and over the heads of helpless Patriot defenders. Rocky River (12-4, 6-3 Great Lakes Conference) certainly had everyone in on the action in a tremendous first quarter that saw the Pirates outscore the Patriots, 30-12. The defense and passing of junior guard Connor O’Toole and senior forward John Ruma spearheaded an 11-3 run over the final three minutes of that opening quarter. The Pirates – winners now of 8-of-9 at home – would extend their lead to 20 points by the midpoint of the second quarter. However, with a widening River rotation and several turnovers converted at the other end for Valley Forge, the second and third quarters were a mostly-even exchange for the Pirates and Patriots. Valley Forge got solid work from Miguel Ortiz and Logan Sasse; both would finish the game with 11 points. The Maroon & White outscored their visitors, 19-4, in the fourth to close out the 31-point plunder. For the Pirates, Tuesday’s victory at Rocky River Gymnasium marked a season sweep of the Patriots. River defeated Valley Forge, 77-55, in Parma on Jan. 11. Tuesday’s win saw the Pirates notch a 53.3-percent (32-of-60) mark in shooting the basketball. The defense held Valley Forge to an 18-of-52 (34.6 percent) performance. Take the exact number out of the equation, because it wasn’t a stand-alone effort. This 2018-19 brand of Rocky River Basketball is one that can pass the rock. And one that can defend it at the other end. 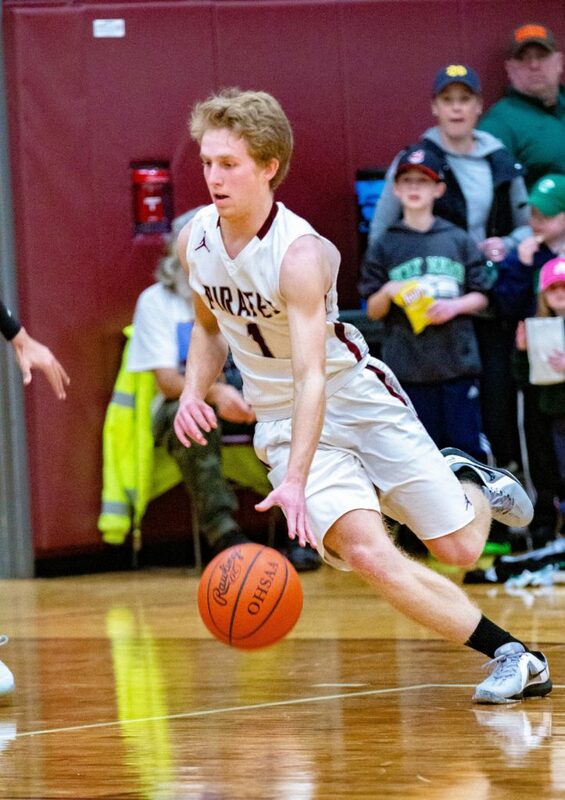 PATRIOT GAMES: With Tuesday’s home-court victory, Rocky River is now 10-7 over its last 17 games against Valley Forge. River’s Basketball Buccaneers have won three straight in the series. ON DECK: The next game for the Maroon & White will be on Saturday, when the Pirates travel to the south side of town for a road game at Lutheran West. The Pirates and Longhorns will tangle in the back half of a girls’-boys’ doubleheader (girls at 5:30 p.m., boys at 7). YOUNG BUCS: Rocky River’s junior-varsity squad lost to Valley Forge, 45-40. River battled back from a 13-point deficit heading into the fourth quarter to make things interesting at the end. Pirate scoring on the night was a depth charge: River got eight points from Andrew Kashmarek and six apiece from Matt George, Matt McDonald and Jack Scholl. The Pirate JV is now 7-7 on the season. … The Rocky River freshman squad played a road game at Oberlin on Tuesday. The Pirates defeated the Phoenix, 57-31. The River Rookies got standout performances by Aidan Coyne, Jacob Florentine and Patrick Lange.